We are down to one daily paper and two Sunday papers from a high in 2005 of two dailies, two weeklies and two Sundays. 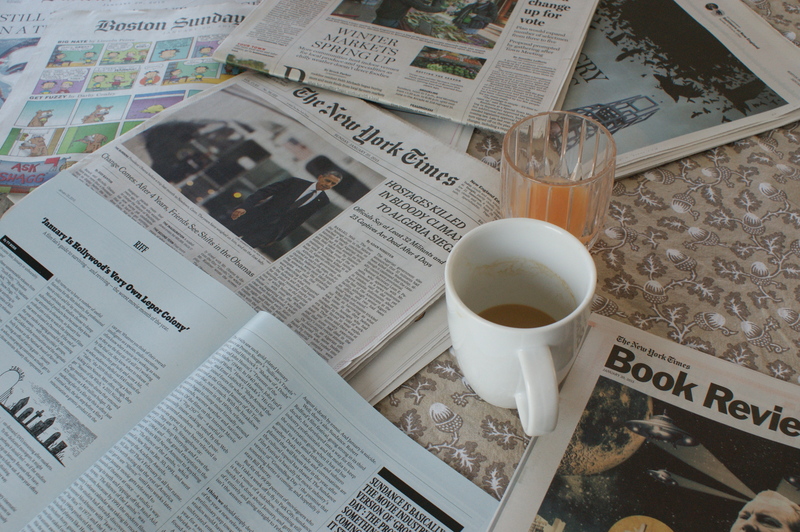 I bore my children every week by announcing a sampling of the papers that flowed through our house when I was growing up: The Daily Record, the Waterloo Courier, the Des Moines Register, the Chicago Tribune, the Wall Street Journal, the New York Times, L’Osservatore Romano. That expanding concentric circle of news and the priority placed on reading it (no phone nor idle conversations before 9am, ever) was as formative an experience as morning Mass and Sunday dinner. Recalling how frustrating this could be from a kid’s point of view, I have to try very hard not to hide behind the paper each Sunday. I don’t always succeed. Even though I have read all the major stories online by the time Sunday morning rolls around, I still look forward to sitting down and seeing what I’ve already read in print and the delight of going through each section to read things I know I would missed on any device. Color funnies and Personality Parade (even though it is terrible now)? On paper, only, thanks. Regional news? Still on paper, all week long (I don’t want my kids to ever ask me “What’s a newspaper like?” That would kill me). I set magazines and book reviews aside carefully so that if I don’t get to them they don’t get recycled prematurely. I still keep the front pages from momentous days, good and bad, on my desk upstairs, where they will eventually make their way to a file box in the attic. You can’t pull out a bookmark of a webpage to show children and grandchildren. 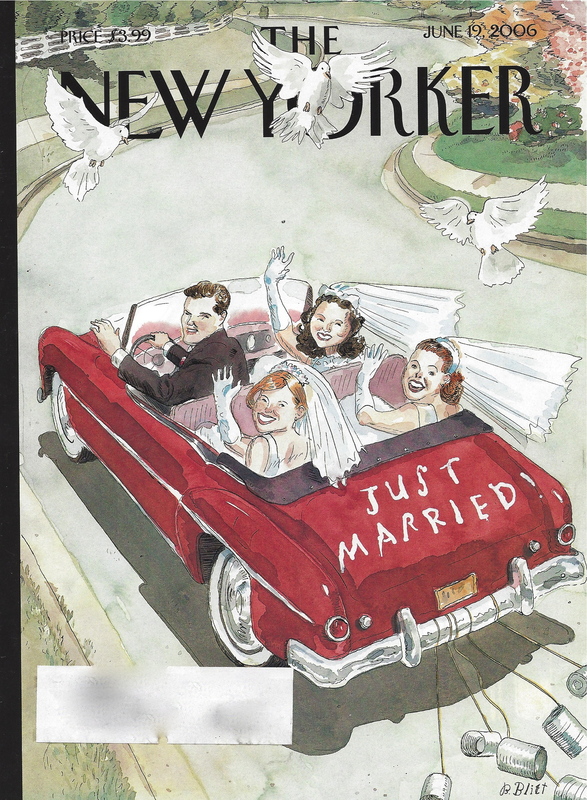 I still subscribe to the print version of The New Yorker, and in a nod to marital harmony and environmental consciousness, I save only the covers (an interesting family exercise: pull out a random New Yorker Cover and see if we can figure out what happened that week just from that piece of art – the stories we make up are just as interesting as the real explanations). I could go on and on…but I need to go finish reading the paper. Wonderful post! I regret that I don’t seem to “have time” to read the newspaper anymore. My husband and I were just talking about re-subscribing to the Sunday New York Times. Seems like the minimum, somehow…. Wonderful to hear from you, Miranda! I think of the Sunday paper as a security blanket sometimes – even when I don’t get to read much of it I feel better just having it there where I can see it. I love the Sunday paper, too. We only have three papers delivered weekly now…so I have to make them last. I am always picking up other weeklies – The college weekly, the Revue, odds and ends of newspapers in my son’s town. I miss getting the paper every day. I rarely read through an entire news article on the web. I am a web skimmer. I have the papers from 911 up in my linen closet upstairs. The entire paper…I think I brought extra.